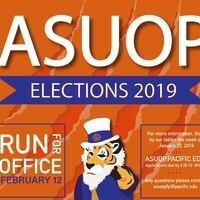 Interested in running for student government office, but want to know more? Come to the information sessions to learn more about the positions available and how you could make an impact to the student experience. We will also review the requirements to run for office and answer any questions you may have. This information session is optional and not required in order to run for office. If you can't make this information sessions, but still need more information email us at ASuopFYI@pacific.edu or visit our website for more information.